A plain-clothes cop thinks he is following a suspect unawares, in fact he is being set up. 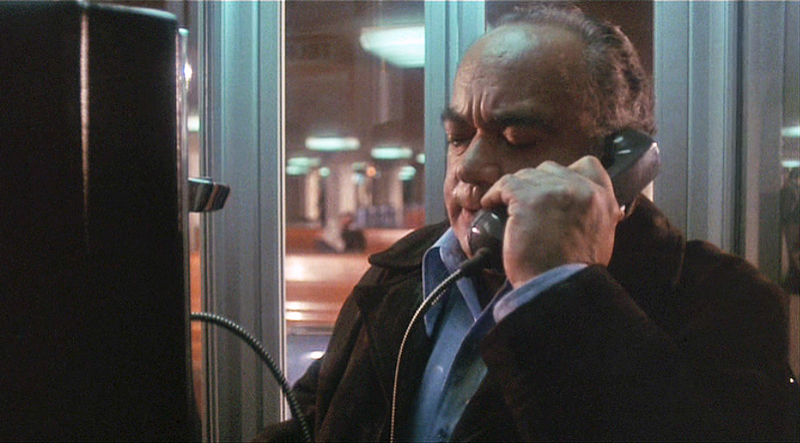 The suspect makes a phone call as the cop on a bench in the background reads a newspaper, trying his best to look innocuous. "It's workin' ...", says the man in the booth, "He's stayin' right with me". Then ... The man walks from the phone booth, one of those against the back wall, glancing back at the cop as he heads towards an exit. 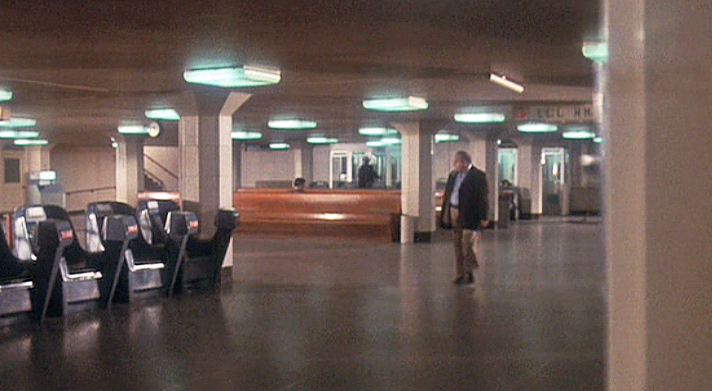 ... and Now, this scene was filmed at the Transbay Transit Terminal on Mission Street south of Market. 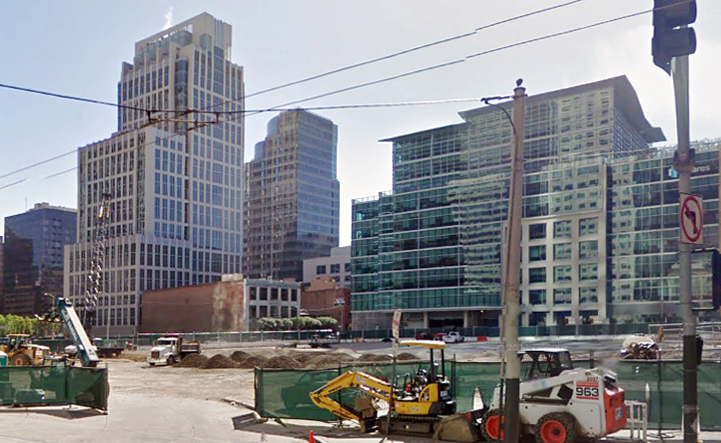 The terminal was torn down in 2010 to make way for a new Transbay Transit Center, still under construction. 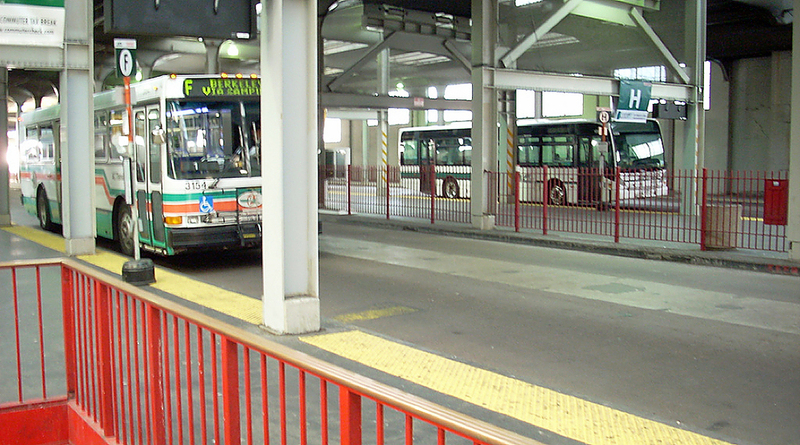 The photo below of the same spot was taken shortly before the terminal closed down. In it we see that those phone booths had been replaced by wall-mounted telephones. ... in 1965 ... this vintage aerial photo of the 1939 Timothy L Pflueger designed terminal was taken a few years before the movie was filmed. The entrance, approached by car via the crescent driveway in the lower left corner and by bus on the ramped roadway above it, was at 425 Mission Street between Fremont and 1st streets (map). ... in 2010 ... per this photo of the Mission Street entrance the terminal had hardly changed as recently as a few years ago. ... by 2011 ... just one year later it was gone, taking with it 71 years of memories but leaving for the moment traces of the crescent driveway. Construction on the replacement is ongoing. Then ... this 1965 photo captured the terminal as it used to look. 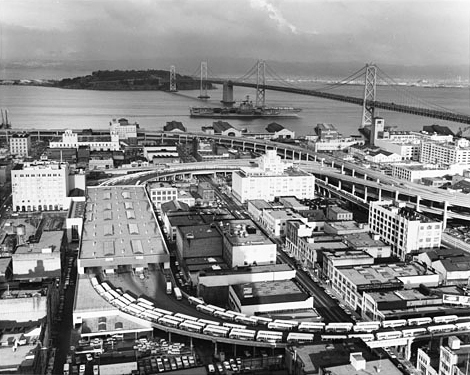 It also captured the ill-fated Embarcadero freeway; it was torn down following damage in the 1989 earthquake. ... coming soon ... work is in progress on the futuristic new terminal, illustrated in this architectural rendering. Scheduled to be completed by 2017 it will act as a hub for 11 Bay Area transit systems, boast a 5.4 acre park on its roof and will link underground to the current Caltrain terminus at King Street. 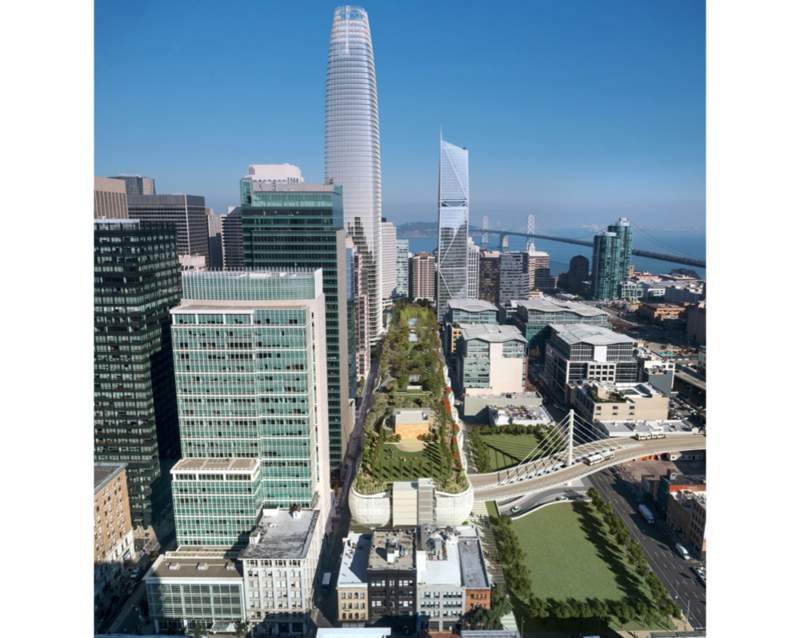 Surrounding it will be new residences, shops, parks and offices, including the Pelli Transbay Tower which will assume bragging rights as the tallest building west of the Rockies at 1070 feet. Then ... the suspect climbs one floor up the stairs to the bus level under the huge shed and boards a 14-Mission San Francisco bus. He is closely followed by the cop who has to hammer on the door but he too gets in. CitySleuth just loves those Art Deco city buses! Such style, unlike today's tin cans. ... in 1973 ... here's a vintage photo on a typical busy day taken in the same boarding area the year the filming took place. That's the E-Claremont bus stop above, the F-Berkeley stop below, both lines serving the east bay. 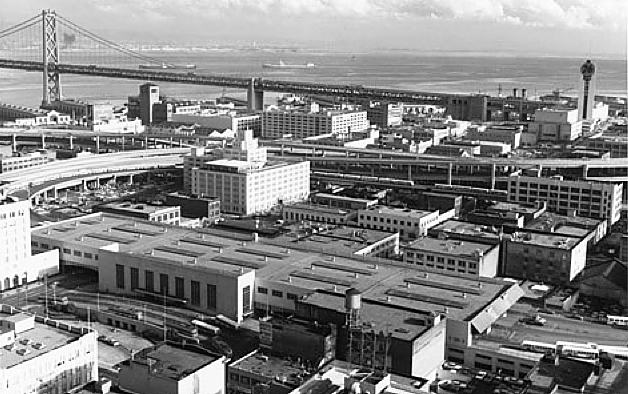 Those pass-through roadways were originally train tracks for the Key System Bay Bridge rail system when the terminal opened. ... in 2008 ... 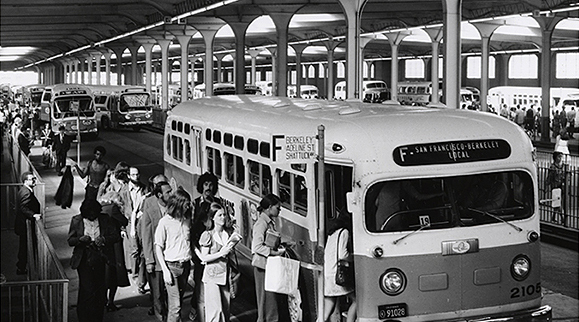 The F-Berkeley continued to operate from here right until the day the terminal closed down, two years after this photo was taken. Note one change though - the steel pillars had been stiffened with an earthquake retrofit. The bus departs carrying suspect, cop and a few other passengers on what will be its last ride, a journey to hell.